These are so easy and quick to make as well as being tasty & healthy. Lay 4 large rectangles of tinfoil on an oven tray and place a fish fillet in the centre of each one. Mix the soy sauce, sesame oil, sweet chilli sauce, garlic, chilli, ginger and coriander stems. Spoon the sauce evenly over the fish. 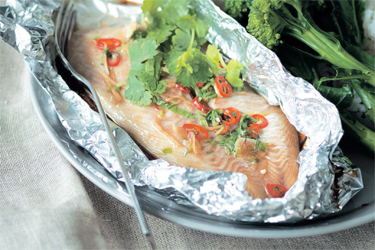 Fold over the foil and wrap up to form parcels. Bake for 7-8 minutes or until the fish is just about cooked through. You may need to vary the time depending on how thick your fillets are. Open the parcels and garnish with coriander leaves and a wedge of lime. Serve with greens, such as bok choy, spinach, broccoli and cauliflower rice on the side. You can make a variation on this using thin strips of chicken in combination with fish, sea food and thinly sliced vegetables including carrots and greens. Add your preferred sauce and cook on the barbeque. A fun dish for the summer where everyone can make up their own parcels and enjoy balanced with a salad and a glass of wine.